14 Cookies or 28 Cookies~We create for you a perfect collection of cookies so that you can "Share the Love" with as many people as you can! Share the Love with friends, family, colleagues, clients...celebrate with the season of love and hearts. 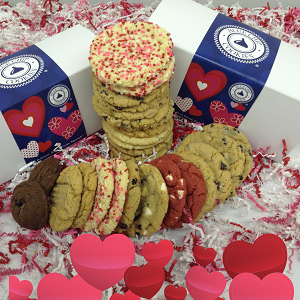 The Share the Love Collection is a great combination of our signature cookies and the top selling Valentine Cookies! 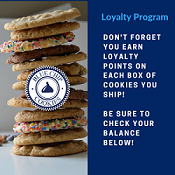 Send 14 Cookies or up to 28 cookies to the same address and save 15%. Use messages such as: Share the Love, Thanks for being the Heart of our Business, Happy Valentine's Day. We put no nuts cookies in this decadent 14 cookie collection! More cookies can be shared! Flavors Available Now for Your "Valentine MyWay Assortment!" Each cookie is 2.25 ounces and 3.5 inches in diameter.